James from Rapid Resolution Tax Group contacted us a couple weeks ago in need of a great-looking website that will help to show clients the services that they offer to help settle back taxes with the IRS. After speaking to James, one of our freelance web designers got to work on the project right away. In just a few days, our web designer completed the website to James’ satisfaction – and even earned a bonus because of having it done in such a short timeframe! Because of the level of service that was provided to James, he also decide to move the web hosting for the website over to our systems as well. Providing a full service offering to our customers ensures that we are their one source solution for web services. 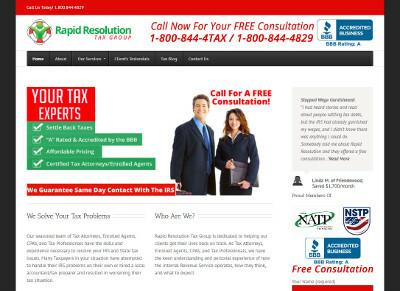 The Rapid Resolution Tax Group’s website is at thetaxreliefexperts.com.